The Degen DE1126 ultra-thin shortwave receiver and MP3 player/recorder. 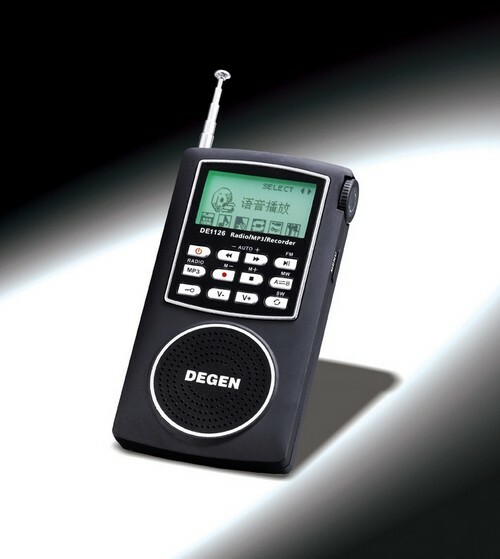 The Degen DE1126 is an ultra-thin, portable shortwave radio receiver with a built-in 4GB MP3 recorder/player. As with most Degen radios, the DE1126 is primarily available through eBay sellers in Hong-Kong. Please see our link below which automatically searches eBay for these sellers. The DE 1126 is a new product. Please notify us if you have a review that should be posted. This entry was posted in Degen, MP3, Portables and tagged DE1126, Degen, Degen DE1126, Degen DE1126 Reviews. Bookmark the permalink.